Do you want to know how fast you can tap on your iPhone? Are you confident in your coordination of your left and right fingers? 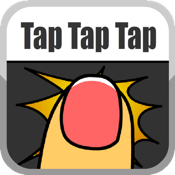 Play this Tap Tap Game! And challenge your friends and they guys all over the world.